For those of you that are sad that Bob $tencil is not covering the Sundance Film Festival with us this year, well, we've got something that may make you happy again. 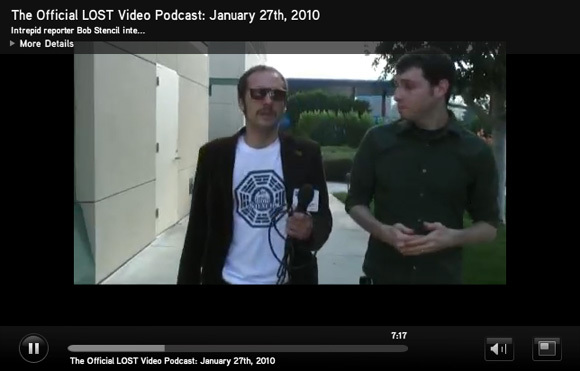 Our favorite moustache sportin' pilot Bob $tencil recently made an appearance on the Official LOST Video Podcast produced by ABC. While it's usually our policy not to post anything TV related, this time I'm making a big exception because it's Bob $tencil and, damnit, he's the man! $tencil chats with executive producers Adam Horowitz and Edward Kitsis as well as actor Michael Emerson (who plays Ben Linus on the show) in the 7-minute video. So check it out below! You can watch the latest podcast by subscribing on iTunes or by visiting ABC.com and watching it online (just click the big photo above). $tencil is featured in the podcast published today, January 27th, so that's the one you'll want to watch. If you're wondering why Bob $tencil is on the LOST podcast at all, he's a big fan of the show, and if you saw his video from Comic-Con last year, the creators of the show are big fans of his as well. You can see the clip when he was given the Bob $tencil Pod shirt (that he's wearing in this) right here. As always, you can find all of Bob $tencil's past videos here: firstshowing.net/bobstencil. Enjoy! Bob $tencil is the man! Give that guy his own show! I love Lost and I love Bob $tencil! "What about me?" "What about you?" Awesome. Can't wait for the premiere, my roommate finally got me watching the show, though I've only fully seen Season 5. Final season of Lost, cannae wait, more questions less answers and a never ending loop, yeeeeehaaaaaaaaaaaaaaaaaaaa. I don't think Bob needs his own show, he'd just be mediocre and forced, the way he is, feels better. Was Michael Emerson really acting when $tencil recited his characters' lines?